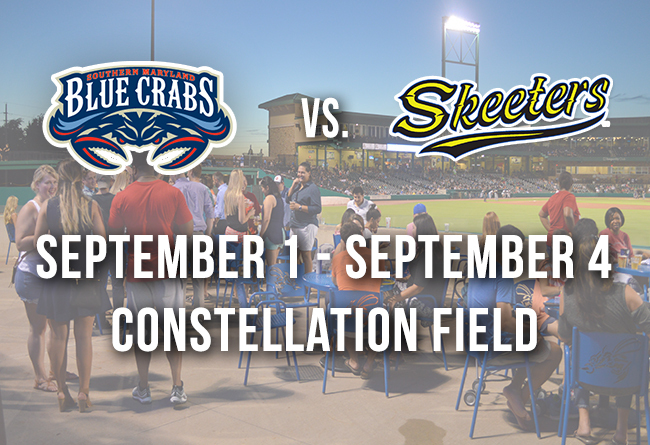 (Sugar Land, Texas, Sept. 1, 2017) - The Sugar Land Skeeters will host the Southern Maryland Blue Crabs at Constellation Field in a four game weekend series beginning on Friday, September 1st at 7:05 PM. All events including the Best Buddies Jersey Auction and fireworks previously scheduled for Friday will be postponed to a date to be named later. Throughout the homestand parking will be free of charge and our $15 tickets will be discounted to $5. However, fans are encouraged to contribute beyond the ticket price to support Fort Bend County disaster relief efforts in conjunction with the Skeeters Baseball Foundation. The Skeeters organization will also be matching all donations up to $50,000. On Saturday September 2nd, the first 2,000 fans through gates will receive a Skeeters Lunch Box courtesy of Texas Direct Auto. In addition, Camo Hats courtesy of Republic Services will be given to the first 2,000 fans in attendance on Sunday September 3rd. Fans may still enjoy Sunday Funday activities including pregame catch on the field, player autographs, and post game Kids Run the Bases courtesy of Dr. Larry Caldwell. First pitch will be at 6:05 PM for both weekend games. Fans are encouraged to bring their furry friends to the ballpark for Bark in the Park on Monday, September 4th at 2:05 PM. Fans can also enjoy dollar hot dogs and discounted margaritas in honor of Dollar Dog/Margarita Monday. The Skeeters welcome the community to Constellation Field this weekend in hopes of providing a sense of normalcy and family entertainment in the midst of Hurricane Harvey. For tickets to all Skeeters home games, call 281-240-4487, download our mobile app or visit sugarlandskeeters.com.